In her newest series, Private Justice, Irene Hannon has once again created a suspense-filled novel that mixes romance and intrigue. 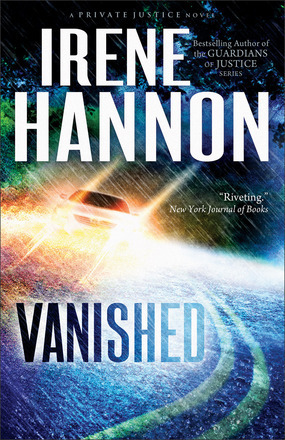 In Vanished, Hannon's main female character - journalist Moira Harrison - finds herself lost during a thunderstorm on a rural Missouri roadway. In a flash of her headlights, Moira sees a woman running. As Hannon describes it, Moira slams on her breaks but it's too late. She realizes she's struck the person, as she slams into a tree on the side of the road. A man stops to help her, and says he will call 911; but when she comes to, there's no help. Only the memory of a startled person in her headlights. When she returns to St. Louis, she begins a quest to find out what happened, who she hit and who the mysterious stranger was who offered help without follow thru. Through a variety of twists and turns, Hannon leads Moira and Cal Burke, a private investigator,into a series of events that are both surprising and intense. The answer is there - but it's one you'll never expect. Vanished is the start of a third series for Hannon. The first, revolved around the military, the second, pulled in law enforcement/FBI guys. This one is focusing on a trio of guys who run a private investigative service in St. Louis. Hannon's style is not gushy romance or unrealistic suspense. It's not mind candy. It's a novel with substance. This is a great novel - especially if you are looking for something with intrigue. Now here's my disclaimer - this is not my favorite novel by Hannon (I still like Against All Odds the best). BUT it is well worth the time you will invest in it. On the scale of one to five, it's definitely a four. I can't wait to see what comes next! For more information about her and her books, Irene invites you to visit her website at www.irenehannon.com. M.K. has grown up and is ready to set the world on fire. Or at least find a way out of Stoney Ridge. In the third book in her Stoney Ridge series, SuzanneWoods Fisher dives into M.K's story and shows how everyone - not just Mary Kate - have a lesson or two to learn about life, love and more. It's an interesting conclusion to the three book series. I'm going to be honest and say this was not my favorite story. I liked the books about M.K. 's older sisters. But like a pesky younger sibling, M.K's tale kind of grows on you - in a good way. No only does M.K. learn a lesson, or two, about love and life expectations - especially when she's pulled into substitute teaching at the one room school; but she helps teach her father and Chris lessons that ultimately help soothe their hearts and souls. On the scale of one to five, this is a solid three. But I give the series at least a four. Once again, Suzanne Woods Fisher has created a series of "bonnet" books (the nickname for Amish fiction) that resonate with the truth. It will be interesting to see what she comes up with next! Centered on one of Suzanne Woods Fisher's most loved characters, this is the story fans have eagerly anticipated. The precocious M.K. is all grown up (well, almost) and ready to take on the world-with surprising results. Fisher's trademark plot twists and turns are as unexpected and satisfying as ever in this third book in the Stoney Ridge Seasons series. In her wildest dreams, spunky and impulsive nineteen-year-old Mary Kate Lapp never imagined herself behind a schoolteacher's desk. A run-in (literally) with the schoolteacher compels her to act as a substitute teacher, just as her restless desire to see the world compels her to apply for a passport . . . just in case. The only thing of interest to M.K. in the sleepy Amish community of Stoney Ridge is the unexplained death of a sheep farmer that coincided with the arrival of a mysterious young man into the community. Frustrated that no one takes the crime seriously, she takes matters into her own hands. Unfortunately, as tends to be the case for M.K., she jumps headlong into trouble. 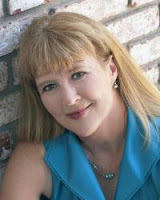 Suzanne Woods Fisher is the bestselling author of the Lancaster County Secrets series and the Stoney Ridge Seasons series, as well as nonfiction books about the Amish, including Amish Peace. She is also the coauthor of a new Amish children's series, The Adventures of Lily Lapp. Her interest in the Anabaptist cultures can be directly traced to her grandfather, who was raised in the Old Order German Baptist Brethren Church in Franklin County, Pennsylvania. Suzanne is a Carol Award winner and a Christy Award finalist. She is the host of internet radio show Amish Wisdom and a columnist for Christian Post and Cooking & Such magazines. She lives in California. For more information, please visit www.suzannewoodsfisher.com and connect with her on Twitter @suzannewfisher. Get Amish proverbs delivered right to your iphone or ipad! Download the Free App! 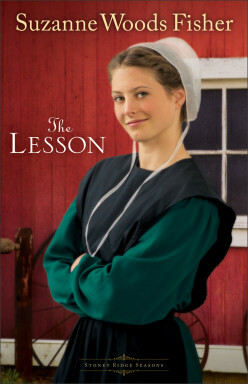 Celebrate the release of The Lesson with Suzanne Woods Fisher by entering to win one of TWO iPads! Enter today by clicking one of the icons below. But hurry, the giveaway ends on January 20th. Winner will be announced on 1/22/13 at Suzanne's Blog. and increase your chances of winning. Rosy, Lily, Violet and Heather are four sisters named for the Texas wildflowers that their mom loved. Raised to be independent women by their parents, the four are traveling through adulthood in the promised land, known as Texas. Then suddenly, and at times unexpectedly, the four begin to find love. Called " 'a romance assortment of petits fours, and as dreamy sweet.'" by Harold Wolf, the novellas found within this collection are sweet. If you read them for the pure fun, "mind candy" point of view, they are as "tastty" as the petits fours from your favorite bakery. You probably don't want to read it from a "realism" point of view. The stories have a theme that is consistent for a "storybook" romance. Girl meets Guy, Girl ponders Guy, Girl falls in love, Guy proposes - all within the space of days. But putting realism, these are a fun "escape from reality." Clean and simple, the book could span generations of female readers. On the scale of one to five, it's a three. Cute stories, easy to read, lighthearted and "sweet." 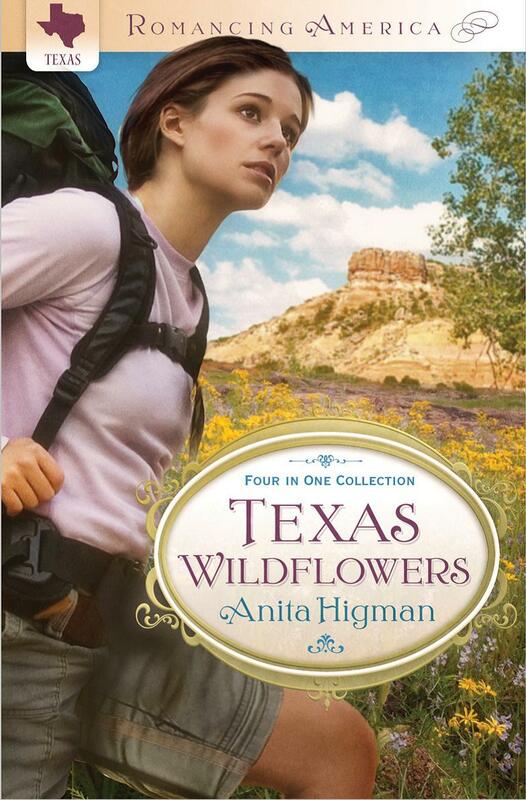 A Q&A With The Author Tell us a bit about Texas Wildflowers. Texas Wildflowers is a 4-in-1 novella collection through Barbour Publishing. Each novella is set in an exotic location in Texas. They are lighthearted romances, and they’re all tied together with the four McBride sisters. Which of the four novellas was the most fun to write? They were each fun to write in their own way, but my favorite character was Lily, the counselor, in Forget Me Not Lily. She was quirky and fun, relatable and loveable. At least that’s what I hope readers will feel. All these novellas are set in Texas. Are the towns and parks real? Yes, in fact one of the novellas is set in Big Bend National Park, where my husband and I went on vacation. So, when you read about the characters on certain trails, they’re real, and we hiked them! Did you have a favorite book when you were a child?I loved fairytales. Cinderella was my favorite. Do you have a vacation spot you’d love to visit? I’m dreaming of Ireland. My husband and I plan to travel there next summer. Can’t wait! Then I’m going to use the emerald isle as a setting in one of my novels. What are 5 things that your readers might not know about you? While I was in college I tried working in a pillow factory. I was terrible at it. I got so weary with the repetition I started yakking with the woman next to me. We got reprimanded over and over until I quit. I discovered one thing from that college job—talking is something I excel at. I once won a hog-calling contest at a banquet. I was not embarrassed, but I should have been. I have a bird phobia, and yet I love birds! (That is, from a distance.) My house is filled with the fake kind—prints on the walls, statues, and general bird doodads. Go figure. Thirty-four years ago I rappelled off a cliff alongside the man I was dating. We kissed in mid-air while dangling off that cliff. I ended up marrying that man, and we've celebrated our 33rd wedding anniversary! I’ve won two book awards. One of my co-authored books entitled, A Tribute to Early Texas, won a San Antonio Conservation Society Citation as well as a Westerners International Book Award. Also, I was given three honors by readers: I was a Favorite New Author in the 15th Annual Heartsong Presents Awards, and my co-authored novel, Castles in the Air, was a Favorite Contemporary Romance in the 16th Annual Heartsong Presents Awards. My most recent award is a 2011 RWA Readers Choice Award (first place) for my novella, Once Upon a Christmas Eve. When readers finish the last page of Texas Wildflowers, what do you want them to come away with? I would love for them to be inspired, challenged, and entertained. If I accomplished even one of those things I would feel my writing time wasn’t wasted. Where can your readers connect with you online? Please drop by my website at www.anitahigman.com, or visit my Reader Page on Facebook and chat with me there at http://www.facebook.com/#!/AuthorAnitaHigman. Every blog that gets comments from at least 10 different commenters (besides the author and the blog tour host) will offer a free book to one of the commenters. Be sure to tell your friends to come read this blog and leave a comment! Share on facebook, twitter, linked-in or wherever you hang out! Note: As a freelance journalist, I was provided a copy of this book by a publicist working with the author. This review was not influenced by a free book - just in case you (or the FTC) were worried about this detail. But it's a way I can engage my brain, and hands, so I can focus - and really absorb what I'm hearing. I tend to sketch using my electronic sketch pad (Sketchbook pro -free version) app on the good old iPad. It started as a way to "Pray in Color" (a creative form of prayer) and evolved into well, into something else. My inner geek also turned it from a paper journal and pen into something I do on the iPad. Sunday's sermon by my friend Clark gave me a lot of food for thought. As he talked, I drew this picture. It's a combination of a variety of things - his illustration of finding new growth springing up from an "old' tree stump in the woods, and his visual illustration of the scene in Chronicles of Narnia: Lion, The Witch & The Wardrobe, where Father Christmas gives three of the children gifts. Clark compared Father Christmas' actions to how the Holy Spirit gives us gifts to use and help others. First: Hope is present in our lives - no more so than at the start of a New Year. The "thaw" that brought Christmas to Narnia also brought hope to everyone in the land. There's something refreshing about 01/01/13 - it's like we've been given a fresh sheet of paper in life's sketchbook, that's just aching for something new. Second: What new seeds has God planted in my life, which will grow into something amazing this year? What new growth will come from something I think is "dead" or at least, obsolete. What change or at least, new adventure, is in store for me this year? I'm still processing Clark's sermon. But I know one thing, on this cold, gloomy day. Just like Father Christmas says in Narnia: Winter is not forever, and Aslan is on the move. God has a plan for 2013. I'm just waiting for it to spring up and start to grow. 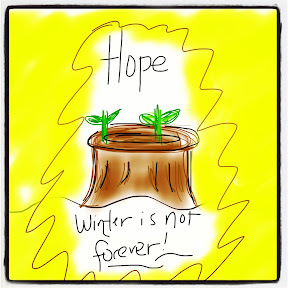 Winter is not forever. Hope for a new year and a new future is here. I just have to imagine the possibilities. Hum... imagine, my word for 2013.... more on that later.